Normally, wall studs and joists are located so that they do not have to be cut to install heating ducts. When ducts must pass up through a wall to heat the room above, the top and bottom plates must be removed at these points, and the ducts are then fitted between the studs. When a partition is supported on doubled floor joists and a heating duct is to go in the partition, the joists are ordinarily spaced apart, with blocking, to allow room for the duct. This eliminates the need to cut framing members unnecessarily or to use intricate duct angles. Return air grilles, usually located on inside walls near the floor level, can be connected to a duct or an enclosed stud space. At this point, the bottom plate and subfloor is cut to make a passage for the duct or air space. Blocks are nailed between the joists to support the ends of boards if diagonal subflooring has been used. Sometimes, the studs have to be cut to accommodate large return air grilles. 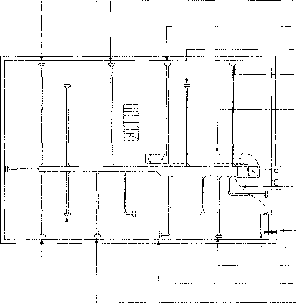 Basement plan showing typical heating layout. of the furnace, under floor registers, and at the bottom of vertical ducts. 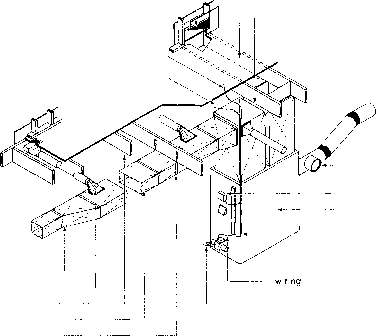 Isometric view of typical heating unit. warm air supply extended plenum warm air take-off floor joists plenum strap supports smoke pipe barometric damper copper tubing from burner unit looped and taken in concrete slab to oil storage tank return air — one or two joist spaces with bottom and end boxed-in with sheet metal generally 3" (75 mm) clearance required from wood members warm air supply extended plenum warm air take-off floor joists plenum strap supports smoke pipe barometric damper relay control box heating unit conduit fastened to heating unit copper tubing from burner unit looped and taken in concrete slab to oil storage tank ter. Then, only the subfloor and floor covering need to be cut. 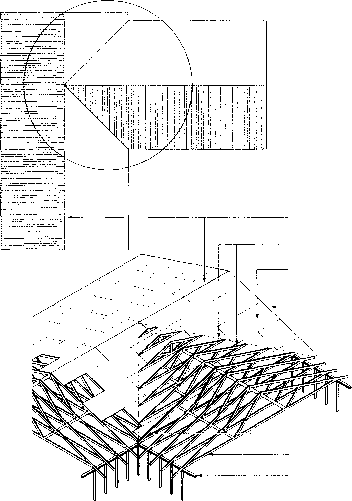 Diagonal subflooring must be supported by blocking at this point. In houses with a crawl space, a warm-air furnace can either be put in a special compartment on the floor of the house, hung under the floor or mounted on a concrete base in the crawl space beneath the house. In the first two cases, the joists will have to be designed to carry the weight of the furnace. Ventilation is often coupled to the warm air heating system of the house, using the heating ducts to also distribute ventilation air. In some cases, particularly for houses without forced air heating systems, dedicated, whole-house ventilation systems are used. 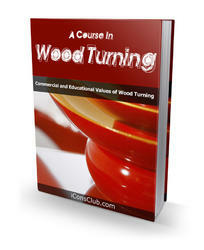 These systems often require ducts that are smaller than those required for used for heating purposes. They are accommodated by the framing in a manner similar to the warm air systems.